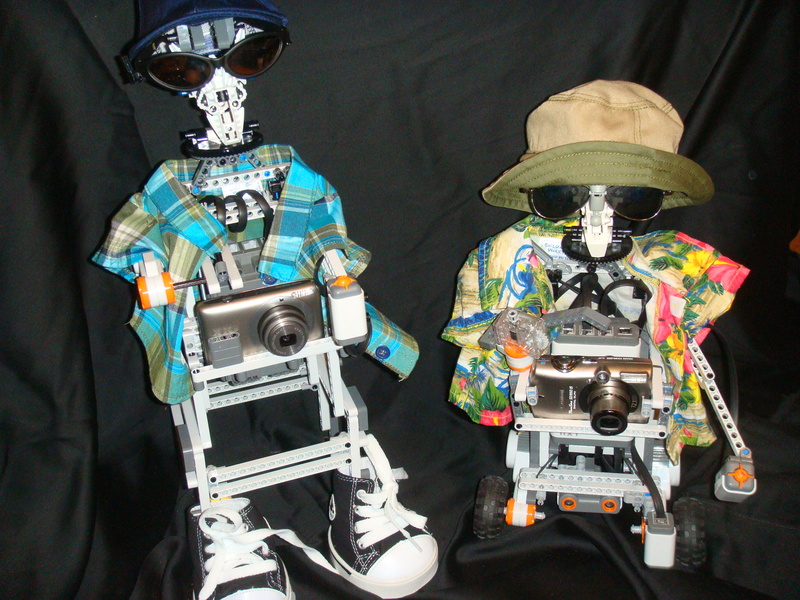 I built the original Touristbot for BrickFair 2009. The concept was simple enough, a LEGO Mindstorms robot that could take pictures at the event. Although the execution was slightly more complex than it needed to be, the robot was a success and took hundreds of pictures at BrickFair and subsequent events. Unfortunately, with thousands of pictures taken, the moving parts slowly wore down and it was time to restart and rebuild. Having spent two years with Touristbot as my signature piece as I displayed at different events, I was familiar with its faults and wanted to correct them as I iterated to the next version. The first problem was the harness was never built correctly for the camera, since I built the robot before having the camera in hand, the harness never fit properly and would hit buttons on the back of the camera when I placed it, but since I had planned to reuse the same camera, I could build for Touristbot’s camera. The second issue was the way the arm came down and across the camera to push the button. This was an overly complex mechanism that looked cool when it took a picture, but it put too much pressure on the camera and harness and wore out too many pieces. The third was that I was always needing to prop up Touristbot, so the 2.0 needed to be slightly taller. Basing the partial design on the original Touristbot, building went quickly on the new version, until I hit a small snag. I knocked the camera off my coffee table, while it was turned on, giving the infamous “Lens error, restart camera,” an error that is essentially the kiss of death for that camera, since the lens will not retract and costs as much as a new camera to replace. I went out and purchased a new camera (an expense I had definitely not planned on) and then had to modify the work I had done to accomodate the thinner camera with the smaller button. Luckily I was able to adjust the work I had done and work with minor alterations to accomodate my new camera. The big change was to the mechanism itself. I took the old mechanism and decided to try to make it as simple as possible. The new motor arm simply put a rod and a technic piece that would spin on the rod and trigger the camera, then spin back up once the picture was taken. A far simpler concept and far faster to developer than my previous version that went though too many complex configurations that didn’t work. Sine this was the second version, I was able to take the lessons I learned over the month building the original Touristbot, I was able to build Touristbot 2.0 in a week, even with the camera issue. The final step, as with Touristbot 1.0, was to dress and name it. A return trip to Build-a-Bear Workshop aided me in clothing the new robot, while reaching out to Alejandra and Christina christened the new Touristbot with his new name. 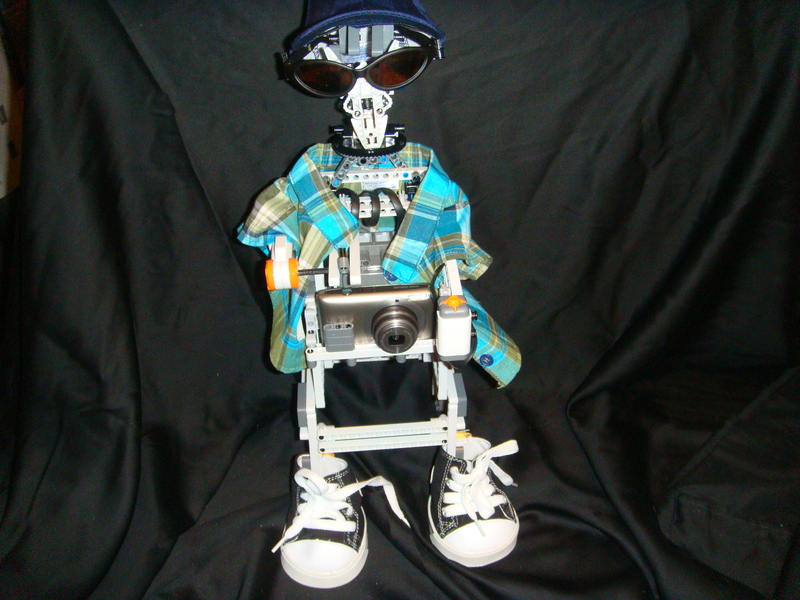 As the original Touristbot was named Norman Fitzpatrick, they chose to name the new one Herman Wong. Touristbot 2.0 was ready to be displayed at the 2011 Lego Fun at Lyndhurst Manor, where he took hundreds of pictures of visitors to the event. Once the minor tweaks that always occur when displaying for the first time were fixed, the robot worked without a problem and I look forward to bringing him to more events this summer.